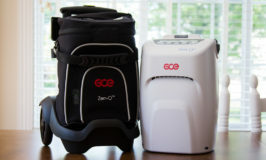 GCE is the newest manufacturer of portable oxygen concentrators. GCE is a British company, though the Zen-O is manufactured in Auburn Hills, Michigan, making it an American-made product. In addition to the Zen-O, GCE has just released a new 5-pound Zen-O lite which provides pulse flow up to setting 5 and is comparable to the Inogen One G3 and SimplyGo Mini. The Zen-O has been on the market since 2016 and has proven itself to be very dependable and easy to use. Most concentrators seem to require 6 months in the marketplace to allow the manufacturer to get the bugs out; however, it appears GCE took the time to test the Zen-O prior to releasing it to the market as it has had very few issues. The Zen-O comes standard with the Zen-O concentrator in an attractive carry bag, AC and DC adapters for home and car, one (1) rechargeable battery (with the ability to hold a second battery), and a slim mobile cart. The Zen-O provides continuous flow up to 2 liters per minute and pulse settings up to 6, making it similar to the Philips SimplyGo, yet it is superior in many features. Most notably is the Zen-O’s dual battery slots, providing double the battery time and less-frequent battery changing. Those using the unit at pulse 2 will enjoy 8 hours of battery time with two Zen-O batteries. Taller and narrower than the SimplyGo, the Zen-O is more comfortable to carry over your shoulder and allows for a slimmer cart, making it easier to put behind your seat in the car or even between your legs. The Zen-O cart is so compact you won’t have to remove and stow it away when traveling by plane. I also like the controls on the Zen-O with its easy on/off button that does not require double inputs like the SimplyGo. And at 38 decibels, the Zen-O is enjoyably quiet. Finally, those with minimal mechanical abilities will find it easy to change the sieve columns on their own, rather than waiting for factory service. 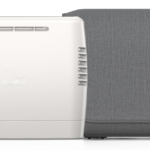 The Zen-O is an excellent option for travelers who need oxygen at 2 LPM only at night and are unable to use pulse flow at night, including those who use oxygen with a CPAP. The Zen-O can easily be packed in your carry-on luggage for a healthy night’s sleep while traveling. 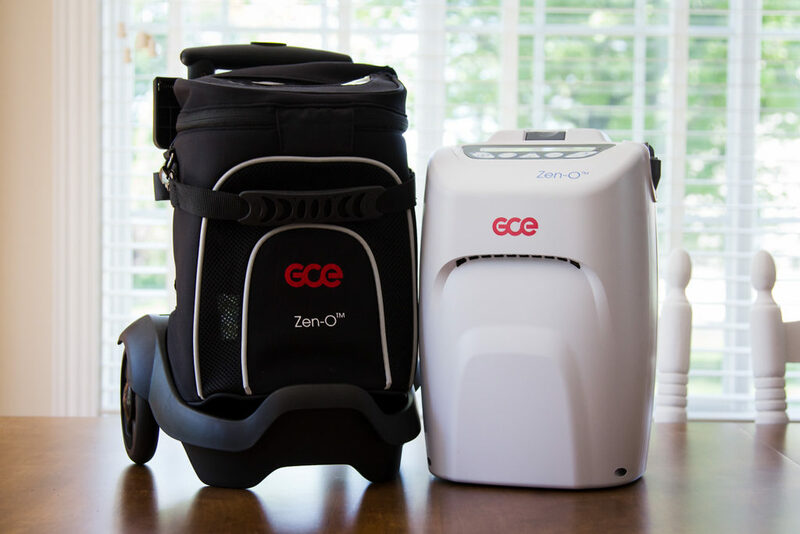 Given the oxygen output, proven reliability, dual battery slots, and ease of use, I would say the GCE Zen-O is the best portable oxygen concentrator in its class (10-pound units). And if higher oxygen levels are not needed, I would also recommend the Zen-O over larger models such as the 14-pound SeQual eQuinox, 18-pound SeQual Eclipse 5 and the 20-pound Oxlife Independence. You can find more information about the Zen-O at GCE Group. Have you reviewed the GCE Zen-O Lite? If so, where can I find it? Our Inogen One G3 has a design flaw in the electrical charging port. It spent 3 months back at factory for repair. and now, 3 months later the same problem has occurred. So we are thinking of changing brands. Thanks for the great srvice you provide. I have not reviewed the Zen-O lite yet; however, I have tested the unit and also heard very positive feedback from others. Of course, it does not have the longevity of testing as the Inogen One G3, but the Zen-O lite appears to have had very few instances of mechanical issues since its release. It’s a few ounces heavier but a bit quieter than the G3. I recommend you make a purchase from a company that offers a trial period and easy returns, but I have no qualms recommending the Zen-O lite. The Zen-O provides continuous flow up to 2 liters only. The SeQual Eclipse is the most powerful unit on the market and it provides only 3 LPM continuous. Unfortunately, there are no POCs on the market that provide 4 LPM. However, you may be able to use the Eclipse with an Oxymizer Pendant Cannula. We are also travelling to Grenada a flight of 4 hours would he need to be on a higher setting for the flight and which portable concentrators would you recommend. Yes, the SeQual Eclipse 5 can provide up to 3 LPM continuous flow. At that setting, the batteries last 1.3 each. For a 4-hour flight, you would need 6 hours of battery time (150% the duration of the flight), which would be 5 batteries. Since the Eclipse can maintain oxygen purity while in flight, he would not need a higher setting. Thinking of getting this for 2 litters at night only. I need something I can take on a plane and is easy to pack and carry for traveling south for winter. I see a big difference between companies. Prices seem to vary slightly, so service is more important to me. Yes, you are definitely on the right path. The Zen-O meets all your criteria and would be a great choice for your oxygen and travel needs. Can we utilize a longer hose so that he can travel around a room without lugging the POC constantly? Or will a longer length of hose negatively affect the output of oxygen? Also, how do you determine the length of a hose a given machine can handle? Geez, how big are cannulas that allow 15LPM?! My tiny nose is bothered by anything rated above 2LPM. I only heard thar the Zen-O portable oxygen concentrator is not durable in terms of battery issues; I’m on the verge of buying one so I need your opinion please. Many models provide minute volume oxygen delivery in pulse flow mode, meaning there is a fixed amount of oxygen delivered over the course of a minute. As breath rate increases, the bolus delivered per breath decreases. This allows the machine to have a more consistent battery duration, although there will be a small decrease in battery time at higher breath rates. The Zen-O, on the other hand, uses a fixed volume delivery in the pulse flow mode, meaning the bolus of oxygen is fixed at each flow setting. Thus, it does not decrease the oxygen per breath when breath rate increases. The benefit is that the Zen-O is more clinically robust and able to provide better oxygen saturation levels than other models. The drawback is that the increased oxygen delivery causes the motor to run harder, which in turn, causes the batteries to drain more quickly. The batteries are not defective, nor less durable; the machine is simply more powerful and requires more battery power when used by patients with rapid breath rates. I am so grateful to have found your column. You and the participants of this blog have answered questions that I been looking for months. This oxygen delivery industry difiantily operates on a Buy Beware base. Don’t ask the right question… well they say … you didn’t ask about that!